"Youve probably heard of me, right? Little Badman. No? Oh. Well. . . Doesnt matter. You will do one day. Im gonna be big. "Im Humza Khan, the greatest eleven-year-old rapper Eggington has ever known; soon everyone will know my name.Only problem is school has got really weird, man. All my teachers are disappearing and our aunties are taking over. It wasnt too bad at the start, they keep feeding us delicious snacks. Like, all the time. But now these aunties are trying to mess with my music, so me and my best friends Umer and Wendy are going to hunt for the truth. Cos something big and bad is going on and we wont let anything mess with my music... or you know, the world. 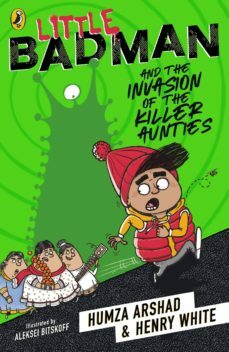 A hilarious and fast-paced adventure from comedian Humza Arshad and screen writer Henry White, perfect for fans of David Solomons and David Baddiel.